Design competitions are nothing new, especially ones geared toward tapping the unbridled energy of young design talent desperate for a little recognition (and hopefully a career bump that comes with that recognition). But a competition that looks to inject some energy into the often-stale furniture industry by actually creating pieces that can be bought seems somehow novel. At least that’s what Desmond Chan and Randy Simmen thought, and it compelled them to launch COFO (the name derived from a contraction of the word ‘co-founders’). Using IDS18 as their launch platform and armed with wads of promotional material and a single product — The Roque lounge chair designed by Toronto-based Trish Roque — word was sent out in early 2018 to young creatives with a fairly simple directive: if you are an Ontario resident in your last year of school, or a recent grad (by which they mean having graduated within the past five years), COFO wants to see your ideas. The response was positive, and a handful of designers were chosen, mostly recent OCAD and Humber College alums. In less than a year, six furniture pieces were produced by Visual Elements, COFO’s parent company, at its 80,000-sq.-ft. manufacturing facility in Woodbridge, Ont. “It takes a lifetime for young talent to get their ideas to the showroom floor. We reduced that to a year, and we give the individual designers a platform and percentage of sales,” says Simmen, who brings a wealth of manufacturing experience to COFO having grown up working for Visual Elements, his family’s business which fabricates high-end retail components for companies such as Coach, Nordstrom and Louis Vuitton. The COFO machine now means consumers can order these ‘fresh-to-market’ pieces through www.cofodesign.com (for Canadian consumers) or www.1stdibs.com (for international consumers) in less than 12 weeks, and the next round of talent mining has already commenced, with calls for the 2019/20 season now open. 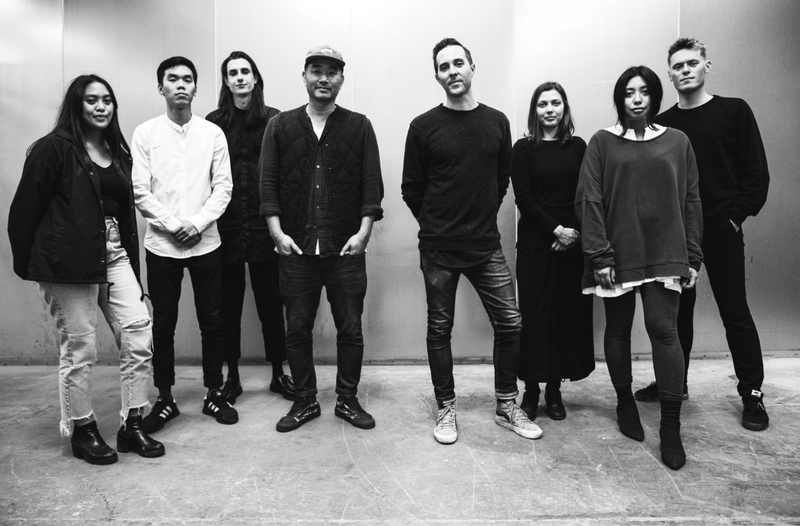 Left to right: Mary Anne Garcia; Kenny Nguyen & Ian Buckley; Desmond Chan; Randy Simmen; Olivia Sementsova; Trish Roque; Lucas Stanios. 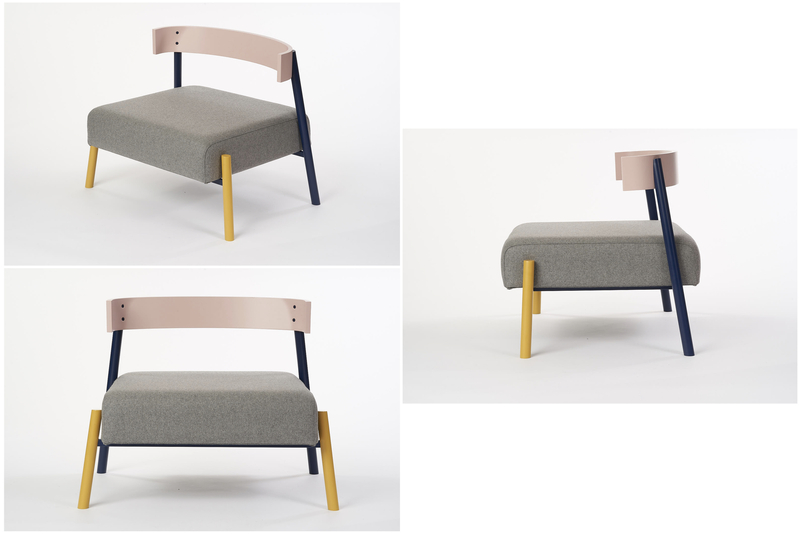 Unveiled at IDS18, this chair, inspired by elements of Japanese and Scandinavian design, is the product of COFO’s first partnership with a furniture designer, well-before the open-call challenge that resulted in these other product collaborations. 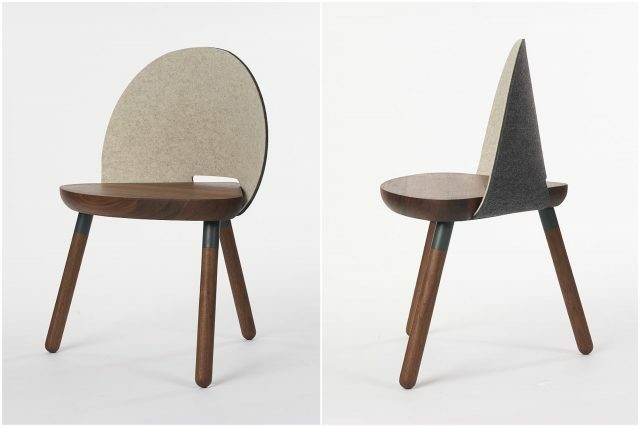 This chair scooped up a German Design Award Special Mention, putting a feather in COFO’s cap right out of the gate. 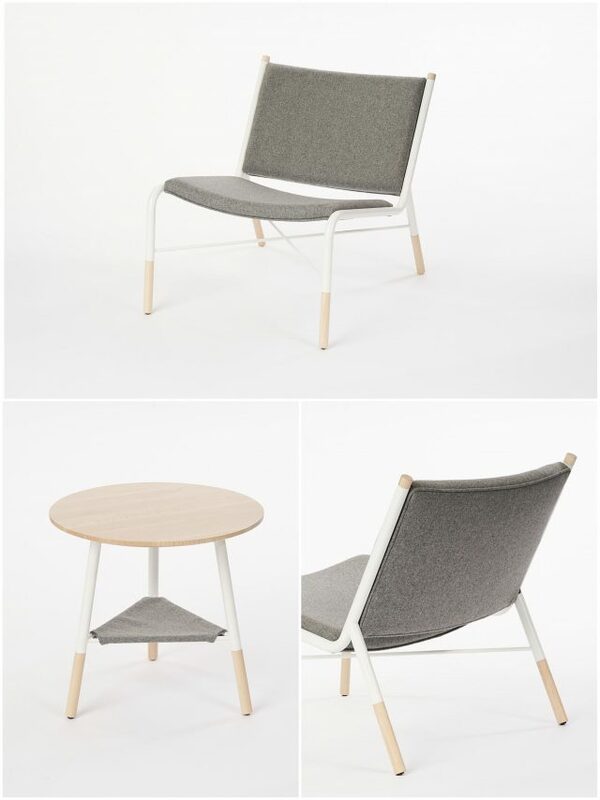 Named after the 49th Parallel, this collection shares primary material choices: laser-cut and fully-welded cold‐rolled steel frame in a matted powder coated finish, with maple or walnut hardwood trim and cushions (or hammock, in the case of the table) coated in Italian melton wool, materials that can be seen throughout COFO’s entire product line. Ultra-Canadian in a material palette of Baltic birch, maple, walnut and 100 per cent wool felt laminate on a sturdy Poly Core. This wool is biodegradable and free of VOCs, making it eligible for LEED points. 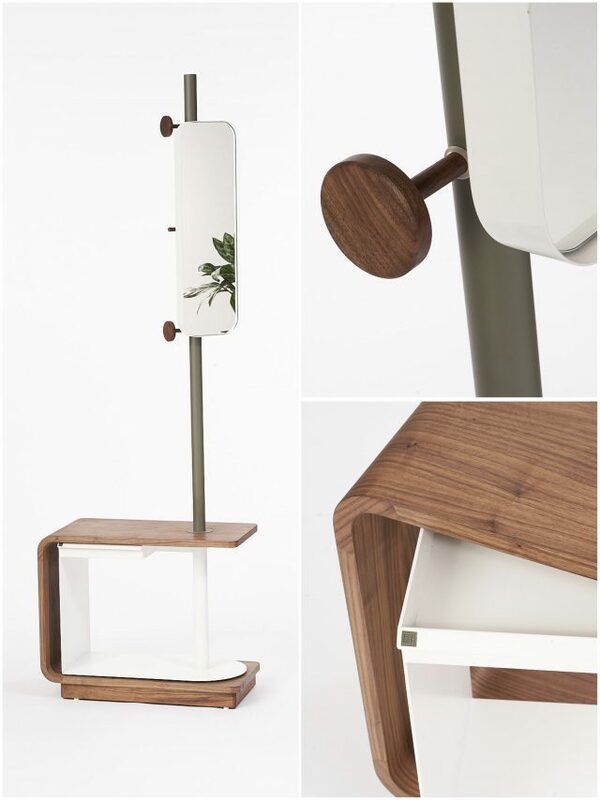 An OCAD environmental design graduate, Garcia’s clever juxtaposition of materials and purposes can be used as a coat rack, side table or night table. 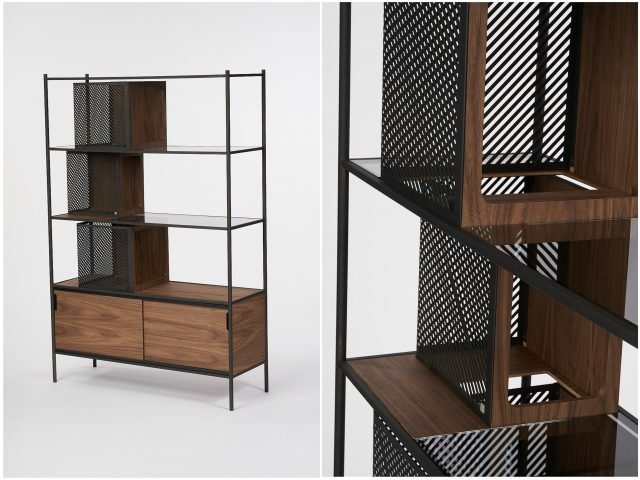 This bookshelf has more going for it than just an eye-catching play of volumes: the tinted, tempered glass shelving houses rotatable cubbies made from laser-cut grills and stained maple veneer wood that are perfect playgrounds for furry feline family members.